Can you believe the holidays have arrived already? Maybe it seems like just yesterday you were soaking up sun by the pool. Now in the blink of an eye, you see holiday lights everywhere you go. Luckily, there’s still plenty of time to make the most of your Christmas this year. Why not spice things up by getting out of your comfort zone and trying a few new traditions this year? If you’re a fan of Christmas carols, Santa and his elves, unique gifts or living out a winter wonderland fantasy, we’ve got just the adventure for you. From Durango to England, here’s your list of new Christmas traditions with a unique twist. What it is: For a few magical weeks, the famous Hyde Park in London, England is transformed into a winter wonderland that will wow the whole family. Enjoy giggles and gasps at Zippo’s Christmas Circus. Or if you’re more into theatrics and stunts, get tickets to Cirque Berserk. If you brought the kids along you can enjoy watching their faces light up at Peter Pan on Ice or the Teletubbies Christmas Show. Looking to enjoy some grown-up time instead? Be sure to grab tickets to a show at the Winter Wonderland Comedy Club. Winter Wonderland Christmas parties will put last year’s office party to shame. Take your pick of one or all four of the party locations. The Bavarian Village brings you the experience of Old Bavaria with cozy chalets and authentic Bavarian bars and restaurants. Bring your dancing shoes, because in the evenings there will be dance parties with live DJ’s. If karaoke is more up your alley, reserve a private hütte in Bar Hütte’s alpine-style village. Each hütte comes with full restaurant service and a private “carol-oke” machine loaded with all the Christmas pop hits your heart desires. Bundle up and get ready for fun if you’re headed to Bar Ice, where you’ll enjoy wintry cocktails surrounded by pristine art sculptures. Even the dishes and furniture are made of ice! Everyone loves a nice, cozy fire in the winter. Pop in to The Fire Pit, an open-air bar featuring a giant fire pit, to get warmed up inside and out. You can even roast marshmallows while you enjoy live bands. No Christmas is complete without Santa! Take the family to Santa Land and have a blast on the ice slide and ice trike trail. The real kicker is getting a behind-the-scenes peek at Santa and his elves making toys to deliver on Christmas day. If you’re looking to enjoy a new skill, be sure to book your spot in an ice sculpture workshop. Enjoy the work of other sculptors at the Magical Ice Kingdom Secret Forest. Book a private flight into London Biggin Hill Airport, famous for its calm and quiet location and pristine conditions with friendly service. From there, you can hop right on a train to Hyde Park and get the full British Christmas experience. What it is: Take gift shopping to a whole new level in Vienna, where the entire city turns into a heavenly Christmas getaway. The stunning city of Vienna becomes even more beautiful thanks to the enchanting lights and smells of mulled wine and roasted chestnuts at the Viennese Dream Christmas Market. The children can enjoy learning how to make Christmas cookies and crafts, and you can shop to the sounds of live choruses from all over the world. Enjoy a day of feeling like royalty while indulging in seasonal treats and one-of-a-kind decorations and gifts in a Baroque setting. If you’d like the full Vienna experience, this Christmas village is a must-see. 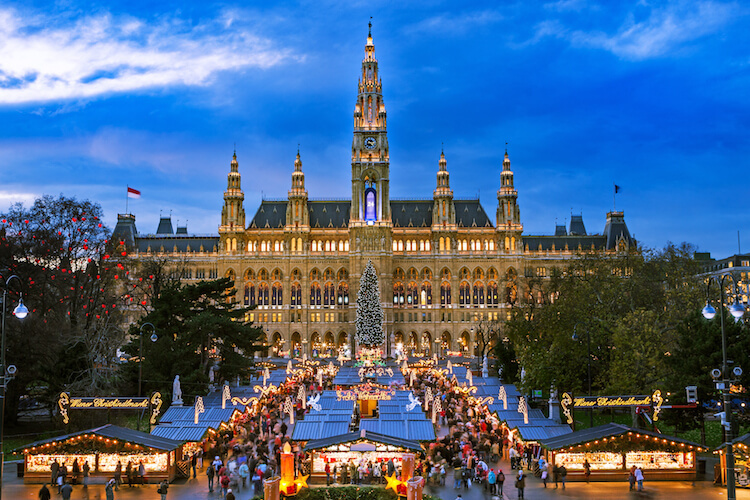 It’s conveniently located between the Museum of Natural History and Museum of Art and is an educational display of traditional Viennese holiday traditions. Enjoy a safe, comfortable private flight to the convenient Vienna International Airport. Once you’ve arrived, you’ll have a selection of private vehicles to take you to your hotel. What it is: Experience the wonder of the Christmas classic The Polar Express firsthand with the Durango and Silverton Railroad’s annual Polar Express holiday train ride. The ride begins with hot chocolate served by Polar Express chefs. Enjoy your cocoa while listening to The Polar Express read over the speakers with Santa’s helpers walking around making sure you get to see the pictures, too. The book ends just in time for your arrival to the North Pole, greeted by none other than Santa himself. He’ll even have a special gift for you. Land in Animas Airpark and enjoy a beautiful view on your limo ride to the train station. What it is: The Krampus Parade in Austria is the perfect Christmas celebration for those with a taste for the darker side of things. Krampus, or the “Christmas Devil,” was created as the counterpart to St. Nick. His job is to punish naughty children. People from all over the world fly to Bad Goisern for the Krampus parade dressed as their own version of the Krampus horns — hooves and all. The parade begins with the sounds of a large brass band and warm drinks and snacks. After the celebration kicks off, each group of Krampus characters parades down the street showing off their unique qualities. Book a flight to Vienna International Airport, make sure your costume is prepped, and take a train to the festival.